Cinema Sunday – Special Edition! 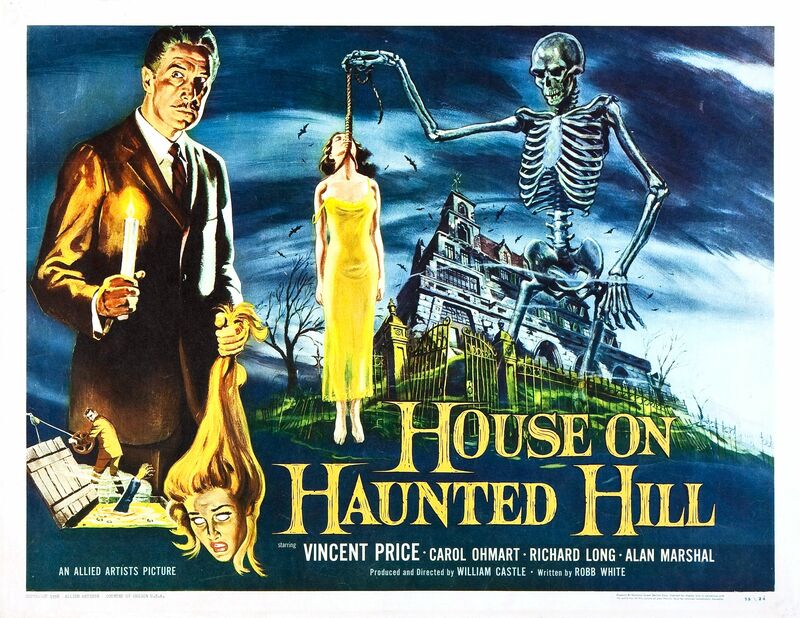 House on Haunted Hill (1959) | Magazines and Monsters! Anyone that knows me (or follows my blog, etc. ), will undoubtedly understand why I’m reviewing this film. Vincent Price is one of my film heroes, and that will never change. His voice, the way he commanded a scene, and his overall creepiness, make him a movie icon. It cannot be disputed or denied. This man’s body of work is incredible, and worthy of high praise. When this film debuted in 1959, Price had already established himself as a B-movie stalwart, starring in hits like House of Wax , The Mad Magician, and The Fly. He also worked on a few more films before those, but they weren’t horror or suspense really. No, it was the horror genre that Price would become infamous for, and I don’t believe he wanted it any other way. A fine actor Price was indeed, but who is the man behind this film? 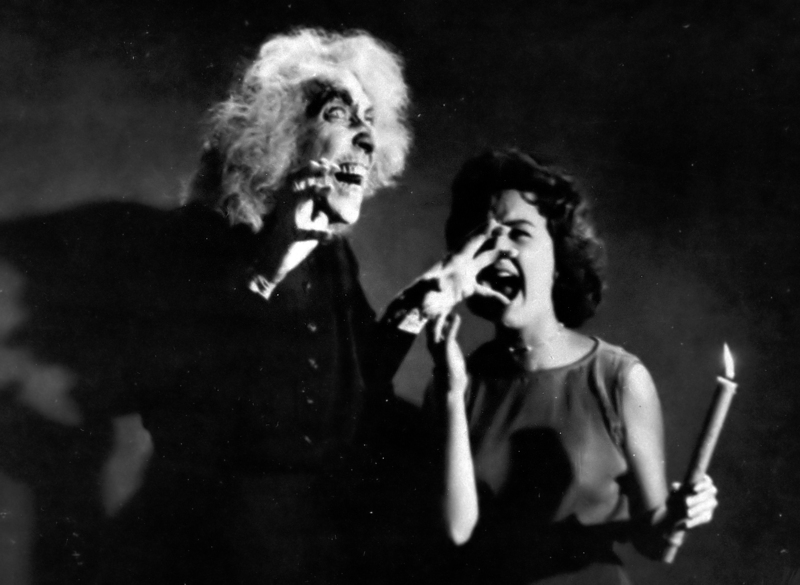 A gentleman named William Castle, that’s who! Let’s just say that this man could churn out a movie on time, within its budget, and oh yeah, it would be great, too! He was the king of gimmicks, but the story was still always there in his movies. OK, now, let us get to the movie! The film opens with a woman’s shriek, followed by ghoulish moans, and more shrieks. 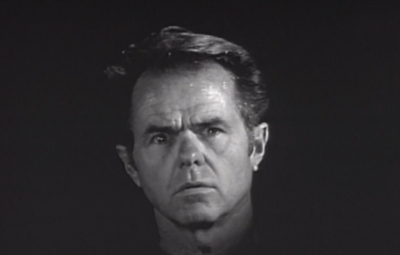 Next, we see the floating head of Watson Pritchard (Elisha Cook Jr.), and he explains that the house you are about to see is haunted. He also tells us that he almost died in this house. Another floating head, that of Frederick Loren (Vincent Price), explains that he has rented this haunted house, and is having a party for his fourth wife, Annabelle (Carol Ohmart). He also is going to offer ten thousand dollars to anyone one of the party-goers who can stay the entire night in the house. You definitely get the impression that he doesn’t particularly care for his wife. As the guests arrive, he introduces them to us, one by one. 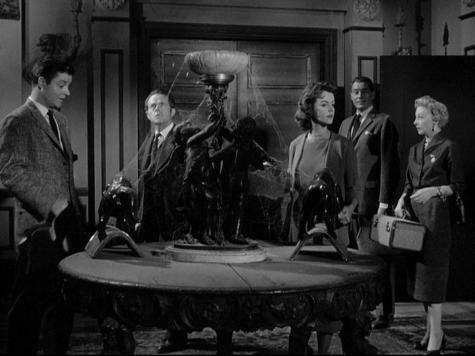 A test pilot, Lance Schroeder (Richard Long), a newspaper columnist, Ruth Bridges (Julie Mitchum), a psychiatrist, Dr. David Trent (Alan Marshal), Nora Manning (Carolyn Craig), who works for one of Loren’s companies (he’s a multimillionaire), and finally, the home owner, Pritchard, who says he needs the money. Loren then heads downstairs and makes some drinks for his guests. He then takes them on a tour of the house, and Pritchard tells them about some of the murders that took place in th house at one time or another. Some blood drips on Ruth, and Pritchard tells her that she’s been “marked” but they laugh it off. In the basement, they see the pit of acid that one man supposedly used to kill off his wife. Nora almost falls in, and everyone gasps. Lance then gets Nora alone, and begins to hit on her. Nora explains that she needs the money because she’s the only one in her family that’s working. Lance opens a door, and walks in, and the door immediately shuts behind him. Nora tries to open it, but can’t even budge it. The lights go out, and a weird noise starts up, and scares Nora. She looks across the room, and a ghastly figure appears. She nearly dies of fright, and after the apparition disappears, she runs into the other room where everyone else is congregating. They all rush to find Lance, and he’s lying in the room, with a huge gash on his head, bleeding. Lance then has Nora help him try to figure out what happened when he was hit on the head. He and Nora split up just for a moment, and once again, Nora sees the horrible woman/ghost, as it menacingly leans over her, she huddles down near the floor. It floats away, and Lance hurries in. She tells him what happened, but he doesn’t believe her because he didn’t see anything. She leaves in a huff, and goes upstairs. She runs into Annabelle, and the two have a talk. You get the feeling that Annabelle thinks that her husband is fooling around with Nora, but she denies it vehemently. After that, Annabelle runs into Lance, and they have a talk about the house, and about Loren. Annabelle seems to be scared that Loren is going to try to kill her, and Lance seems puzzled. Annabelle rushes back to her bedroom, and Loren comes in and threatens her, that she’d better come downstairs, or else! As the night grows older, more and more hi-jinx ensue, with some of the shenanigans getting even more deadly by the minute! Is ten thousand dollars worth being scared to death or worse? Watch and find out! When you look at this film’s budget, and the fact that it made a ton of money (for its time), this film is a gem that cannot be undervalued. Price is his usual brilliant self, but the rest of the cast also gives quite a good performance. Some of the scenes are hilarious, and really add to a movie that already is gold. At one point, Price and Ohmart are jabbing back and forth at each other, and Price tells her not to “stay up all night thinking of ways to kill him, because it will give her wrinkles.” Another great touch is when Price is attempting to assuage the fears of the guests, so he hands out pistols to each of them. The guns are being kept in little miniaturized coffins! Carolyn Craig (Nora) gives a good performance as well, and should be applauded for it. The cinematographer (Carl E. Guthrie) must be mentioned, as his efforts were monumental considering what he had to work with budget-wise. William Castle was the ultimate showman, and he was the king of gimmicks. 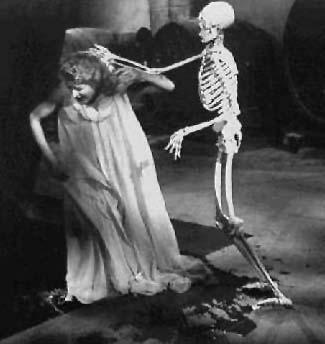 He had most of the theaters rigged with flying skeletons, to try to scare the audience. 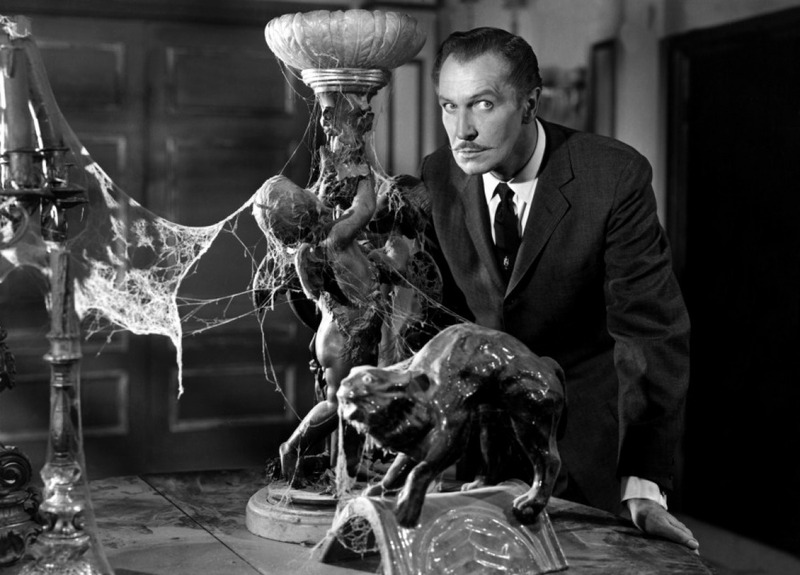 This was something he used many times, but most notably in this film, The Tingler (1959), and 13 Ghosts (1960). His biggest commercial credit is being the producer of Rosemary’s Baby (1968). This film lapsed into public domain, so give it a shot, you have nothing to lose! We had the Vincent Price marathon on earlier (Pit and the Pendulum, Masque of Red Death, Fall of the House of Usher, Haunted Palace). On my TV right this minute is House of Wax. Such is my wild Friday night. House of Wax is my favorite Price film!